Front Street Shipyard is preparing the future site of its Building 6 expansion. Construction is expected to start in July, and employees should be able to move into the building by October. 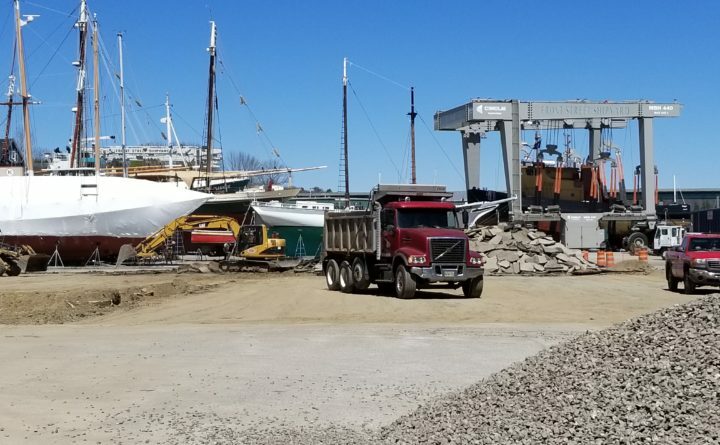 BELFAST, Maine — A Maine shipyard has broken ground on a major expansion that it hopes will help attract carbon-fiber ferry construction contracts. After five years of planning and trying to secure financing, Front Street Shipyard is nearly ready to build Building 6, which would be the shipyard’s largest structure. The 21,700-square-foot building will be 69 feet tall, which is 11 feet taller than the shipyard’s existing workshop. Front Street expects to invest about $4.6 million in the expansion. The new space will allow the shipyard to court customers with larger superyachts in need of repairs, restoration or refitting, and possibly lure other new business. Front Street has been trying to break into carbon-fiber ferry construction, building vessels for cities from New York to Seattle, and the new facility would give the yard more leverage when vying for those contracts. Still, construction of Building 6 won’t depend on ferry deals, and the ferry deals won’t necessarily depend on the construction of Building 6, shipyard President JB Turner said. Street congestion has cities across the nation looking to increase traffic on rivers and oceans to remove some of the strain. “We expect to be able to add 30-40 people for Building 6,” Turner said Friday. That number will grow larger if the shipyard starts attracting ferry contracts. In 2013, the shipyard purchased a new 485-ton lift to haul large boats out of the water. That lift is too large to fit inside Building 5, but could fit into Building 6. On Thursday, crews dug up a median in the former town parking lot purchased by the shipyard. On Friday, they were digging up sections of the parking lot and moving gravel. Earlier this week, Androscoggin Bank, city and shipyard officials signed documents securing financing for the project. The foundation for the building should be finished in July, and the structure will go up soon after. Employees should be able to move work into the building by October, Turner said.